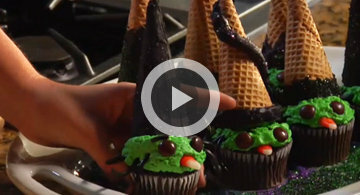 Halloween Recipe How To Videos - Spooky Fun! Watch Chef Charlotte cast a delicious spell over our party-perfect recipes. See how you can your own bewitching meal time. We love fondue year‑round, but we especially love it when you can eat it with bones. A family favorite that's super delicious—and a little bit scary. Make your cupcakes come to life. These cupcakes might even cackle. Transform blue corn chips and cheddar cheese into a tasty colony of bats. 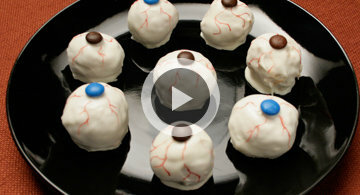 Try out this perfect no bake sweet treat at your next monster bash. Concoct the perfect potion for your scary soiree.